Have you collected stamps or are you still a collector? If your answer is yes, our first day cover is the perfect choice for you! The Gömböc was the focus of the Hungarian pavilion at the Expo in Shanghai, in 2010. Due to the importance of this event, the Hungarian Post Office has issued stamps and booklets in memory of this special occasion. Each unique stamp (with a face value of HUF 100) shows a different characteristic position during the movement of Gömböc. Our first day cover is provided with one of these special Gömböc stamps. 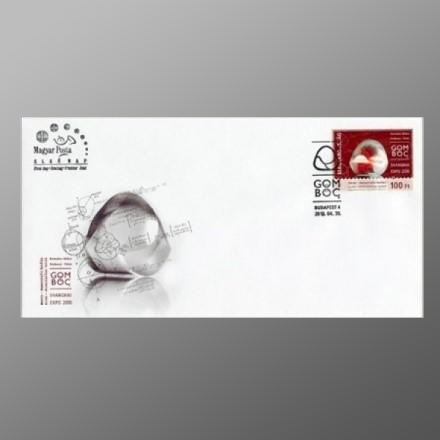 We also send you two first day of issue postmarks (one with date and Gömböc logo as well as an extra one).